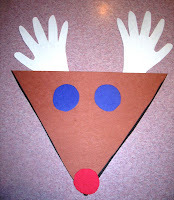 For our Christmas program one of our props is "Rudolph." We don't sing the full version of "Rudolph the Red-Nosed Reindeer," but another song that mentions him. So when we sing this song we hold up this reindeer. First when the children come to the table. I fold a piece of white construction paper in half, then trace their open hand. Then,I give all the children a brown piece of construction paper with a triangle drawn on it. I have them cut the triangle out while I cut out the handprints. With older children you could allow them to cut out both items. After the pieces are cut everything has to be glued together. I usually have them glue the antlers on first. I glue them on the back of the reindeer head, sticking out the top. Then we turn the paper over and glue on the eyes and nose. I usually have some circles already cut out for these items; red for the nose, any color for the eyes. You could use any items you like for this though; wiggle eyes are always fun, and red pom poms look great for a nose. Wallah...he's done. We made this project the second week of December. I read a great book today. It doesn't have anything to do with reindeer, but it is a Christmas book. The children wer e so engaged in the story that I didn't have to ask for their attention once. 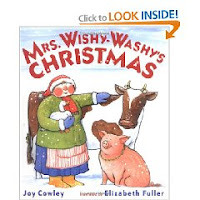 The book I read was "Mrs. Wishy-Washy's Christmas," by Joy Cowley, illustrated by Elizabeth Fuller. The story is about three animals that have to take their Christmas bath in the barn. a cow, a pig, and a duck. Well, it is freezing in the barn and they can't imagine bathing in the cold water. Mrs. Wishy-Washy says they have to get a bath, or no Christmas presents. Did they take the bath? Did they get presents? Fun story! (The link I gave is for the hardcover so it is a little expensive, but at least you get to look inside. There may be cheaper ones out there). Offering a complete keep a record of preschools all through the kingdom. You take home the greatest decision in lieu of your children. In lieu of Parents, we offer a complete roll of preschools all through the state. So they are unbiased and portray qualities of what did you say? The prepare has to offer. In lieu of schools, we offer the newest, greatest, and just generally prepare roll.